a. Organisation for European Economic Co-operation. The Organisation for Economic Co-operation and Development (OECD; French: Organisation de coopération et de développement économiques, OCDE) is an intergovernmental economic organisation with 36 member countries, founded in 1961 to stimulate economic progress and world trade. It is a forum of countries describing themselves as committed to democracy and the market economy, providing a platform to compare policy experiences, seek answers to common problems, identify good practices and coordinate domestic and international policies of its members. Most OECD members are high-income economies with a very high Human Development Index (HDI) and are regarded as developed countries. As of 2017, the OECD member states collectively comprised 62.2% of global nominal GDP (US$49.6 trillion) and 42.8% of global GDP (Int$54.2 trillion) at purchasing power parity. OECD is an official United Nations observer. In 1961, the OEEC was reformed into the Organisation for Economic Co-operation and Development by the Convention on the Organisation for Economic Co-operation and Development and membership was extended to non-European states. 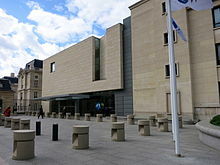 The OECD's headquarters are at the Château de la Muette in Paris, France. The OECD is funded by contributions from member states at varying rates and had a total budget of €374 million in 2017. The Organisation for European Economic Co-operation (OEEC) was formed in 1948 to administer American and Canadian aid in the framework of the Marshall Plan for the reconstruction of Europe after World War II. It started its operations on 16 April 1948, and originated from the work done by the Committee of European Economic Co-operation in 1947 in preparation for the Marshall Plan. Since 1949, it was headquartered in the Château de la Muette in Paris, France. After the Marshall Plan ended, the OEEC focused on economic issues. According to Yanis Varoufakis, the OEEC can be seen as a continental planning commission established by the victorious United States following the successful model of their planning commissions of the New Deal. The economic philosophy these commission followed can be characterized as Keynesian. The lead in the organisation should be in French hands, with a strong integration of the Germans. In 2003, the OECD established a working group headed by Japan's Ambassador to the OECD Seiichiro Noboru to work out a strategy for the enlargement and co-operation with non-members. The working group proposed that the selection of candidate countries to be based on four criteria: "like-mindedness", "significant player", "mutual benefit" and "global considerations". The working group's recommendations were presented at the OECD Ministerial Council Meeting on 13 and 14 May 2004. Based on these recommendations work, the meeting adopted an agreement on operationalisation of the proposed guidelines and on the drafting of a list of countries suitable as potential candidates for membership. As a result of this work, on 16 May 2007, the OECD Ministerial Council decided to open accession discussions with Chile, Estonia, Israel, Russia and Slovenia and to strengthen co-operation with Brazil, China, India, Indonesia and South Africa through a process of enhanced engagement. Chile, Slovenia, Israel and Estonia all became members in 2010. In March 2014, the OECD halted membership talks with Russia in response to its role in the 2014 Crimean crisis. In 2013, the OECD decided to open membership talks with Colombia and Latvia. In 2015, it opened talks with Costa Rica and Lithuania. Latvia became a full member on 1 July 2016 and Lithuania on 5 July 2018. Colombia signed the accession agreement on 30 May 2018 and will become full member after the ratification of the accession agreement and the deposition of the ratification document. The OECD publishes and updates a model tax convention that serves as a template for allocating taxation rights between countries. This model is accompanied by a set of commentaries that reflect OECD-level interpretation of the content of the model convention provisions. In general, this model allocates the primary right to tax to the country from which capital investment originates (i.e., the home, or resident country) rather than the country in which the investment is made (the host, or source country). As a result, it is most effective as between two countries with reciprocal investment flows (such as among the OECD member countries), but can be unbalanced when one of the signatory countries is economically weaker than the other (such as between OECD and non-OECD pairings). Additionally, the OECD have published and updated the Transfer Pricing Guidelines since 1995. The Transfer Pricing Guidelines serve as a template for profit allocation of intercompany transactions to countries. The latest version, of July 2017, incorporates the approved Actions developed under the Base Erosion and Profit Shifting (BEPS) project initiated by the G20. OECD Observer, an award-winning magazine[n 2] launched in 1962. The magazine appeared six times a year until 2010, and became quarterly in 2011 with the introduction of the OECD Yearbook,[n 3] launched for the 50th anniversary of the organisation. The online and mobile editions are updated regularly. News, analysis, reviews, commentaries and data on global economic, social and environmental challenges. Contains listing of the latest OECD books, plus ordering information. An OECD Observer Crossword was introduced in Q2 2013. The OECD is known as a statistical agency, as it publishes comparable statistics on a wide number of subjects. In July 2014, the OECD publicly released its main statistical databases through the OECD Data Portal, an online platform that allows visitors to create custom charts based on official OECD indicators. Delegates from the member countries attend committees' and other meetings. Former Deputy Secretary-General Pierre Vinde [sv] estimated in 1997 that the cost borne by the member countries, such as sending their officials to OECD meetings and maintaining permanent delegations, is equivalent to the cost of running the secretariat. This ratio is unique among inter-governmental organisations. In other words, the OECD is more a persistent forum or network of officials and experts than an administration. There are currently 36 members of the OECD with one more country (Colombia) invited to join. Austria 29 September 1961 Europe OEEC member. Belgium 13 September 1961 Europe OEEC member. Czech Republic January 1994 8 June 1994 24 November 1995 21 December 1995 Europe Was a member of the rival Comecon from 1949 to 1991 as part of Czechoslovakia. Denmark 30 May 1961 Europe OEEC member. France 7 August 1961 Europe OEEC member. Germany 27 September 1961 Europe Joined OEEC in 1949 (West Germany). Previously represented by the Trizone. East Germany was a member of the rival Comecon from 1950 until German reunification in 1990. Greece 27 September 1961 Europe OEEC member. Hungary December 1993 8 June 1994 7 May 1996 Europe Was a member of the rival Comecon from 1949 to 1991. Iceland 5 June 1961 Europe OEEC member. Ireland 17 August 1961 Europe OEEC member. Italy 29 March 1962 Europe OEEC member. Luxembourg 7 December 1961 Europe OEEC member. Netherlands 13 November 1961 Europe OEEC member. Norway 4 July 1961 Europe OEEC member. Poland 1 February 1994 8 June 1994 11 July 1996 22 November 1996 Europe Was a member of the rival Comecon from 1949 to 1991. Portugal 4 August 1961 Europe OEEC member. Slovakia February 1994 8 June 1994 July 2000 14 December 2000 Europe Was a member of the rival Comecon from 1949 to 1991 as part of Czechoslovakia. Spain 3 August 1961 Europe Joined OEEC in 1958. Sweden 28 September 1961 Europe OEEC member. Switzerland 28 September 1961 Europe OEEC member. Turkey 2 August 1961 Asia OEEC member. United Kingdom 2 May 1961 Europe OEEC member. Russia: In May 2007, the OECD decided to open accession negotiations with Russia. In March 2014, the OECD halted membership talks in response to Russia's role in that year's Crimean crisis. In March 2019, US President Donald Trump said he would support Brazil's entry into the OECD. However, the South American country must abdicate its status as a developing country in the WTO and declare itself a developed country. The United States was the main opponent for Brazil's entry into the organization, delaying the country's accession process. a The FSI index supplies no figure for Israel per se, but rather provides an average (78.5) for "Israel and West Bank". b OECD total used for indicators 1 through 3; OECD weighted average used for indicator 4; OECD unweighted average used for indicators 5 through 13. Note: The colours indicate the country's global position in the respective indicator. For example, a green cell indicates that the country is ranked in the upper 25% of the list (including all countries with available data). The components of the Composite Leading Indicators are time series which exhibit leading relationship to the GDP at turning points. Country Composite Leading Indicators are compiled by combining de-trended smoothed and normalized components. The component series for each country are selected based on various criteria such as economic significance; cyclical behaviour; data quality; timeliness and availability. The turning point detection algorithm is a simplified version of the original Bry and Boschan routine. ^ "OECD Archives - OECD". www.oecd.org. ^ Highly Commended certificate in the annual ALPSP/Charlesworth awards from the Association of Learned and Professional Society Publishers 2002; see article . ^ The yearbook's website is oecd.org/yearbook. ^ a b c d "List of OECD Member countries – Ratification of the Convention on the OECD". OECD. Retrieved 9 June 2018. ^ a b "Member Countries' Budget Contributions for 2017". OECD. Retrieved 5 July 2018. ^ "World Economic Outlook Database". International Monetary Fund. 17 April 2018. ^ a b c d e f g h i j k l m n o p q r s t "Organisation for European Economic Co-operation". OECD. Retrieved 29 November 2011. ^ "Soviet Union rejects Marshall Plan assistance This Day in History — 7/2/1947". History.com. Retrieved 30 May 2013. ^ "The Economic Cooperation Authority". Marshallfoundation.org. Archived from the original on 17 February 2007. Retrieved 30 May 2013. ^ "What is the OECD? Definition and Meaning". marketbusinessnews.com. Retrieved 6 December 2017. ^ "Organisation for European Economic Co-operation". OECD. Retrieved 6 December 2017. ^ "Getting to the OECD". OECD. Retrieved 28 April 2016. ^ Christopher, Warren (1998). In the stream of history: shaping foreign policy for a new era. Stanford University Press. p. 165. ISBN 978-0-8047-3468-4. ^ "A majestic start: How the OECD was won, in OECD Yearbook 2011". OECD Observer. Retrieved 30 May 2013. ^ a b "The Czech Republic in the OECD". Permanent Delegation of the Czech Republic to the OECD. ^ "A vision for Poland: Joining the world's most advanced". OECD. 23 November 2006. Retrieved 3 August 2013. ^ "South Korea joins OECD". Chicago Tribune. 25 October 1996. Retrieved 3 August 2013. ^ "International Organisations – Turkey's attempts to exclude Cyprus' membership". Cyprus Ministry of Foreign Affairs. September 2010. Archived from the original on 16 September 2011. Retrieved 4 November 2011. ^ "Ministry of Foreign Affairs of Latvia: Co-operation between the OECD and Latvia". Ministry of Foreign Affairs of Latvia. 19 December 2006. Retrieved 4 November 2011. ^ "Slovenia and the OECD". OECD. Retrieved 31 March 2012. ^ "Malta applies to join OECD as full member". Maltamedia. 24 September 2005. Retrieved 4 November 2011. ^ Beatty, Andrew. "EU gives ground in OECD membership battle". European Voice. Retrieved 30 May 2013. ^ "Romania's candidacy for OECD membership" (Press release). Romanian Ministry of Foreign Affairs. Retrieved 30 May 2013. ^ "Bulgarian Govt to Confirm OECD Membership Bid". Novinite. 25 September 2012. Retrieved 25 September 2012. ^ a b "Chair's summary of the OECD Council at Ministerial Level, Paris, 15–16 May 2007 – Innovation: Advancing the OECD Agenda for Growth and Equity" (Press release). OECD. 16 May 2007. Retrieved 26 July 2008. ^ "Chile's accession to the OECD". OECD. 7 May 2010. Retrieved 7 May 2010. ^ a b "Statement by the OECD regarding the status of the accession process with Russia & co-operation with Ukraine" (Press release). OECD. 13 March 2014. Retrieved 5 July 2018. ^ a b "OECD halts membership talks with Russia". Ledger-Enquirer. 13 March 2014. Archived from the original on 13 March 2014. Retrieved 5 July 2018. ^ "Global OECD boosted by decision to open membership talks with Colombia and Latvia with more to follow" (Press release). OECD. 30 May 2013. Retrieved 12 July 2013. ^ "Latvia becomes full-fledged OECD member". LETA. 1 July 2016. Retrieved 4 July 2016. 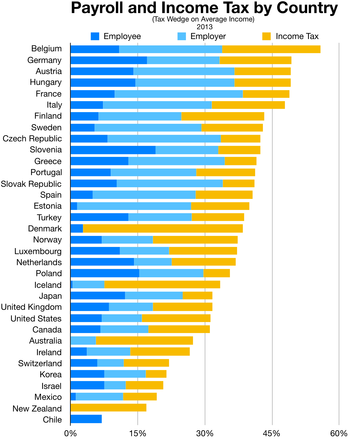 ^ "Lietuva tapo 36-ąja EBPO nare" [Lithuania became the 36th member of the OECD]. Verslo Žinios. 5 July 2018. Retrieved 5 July 2018. ^ a b c "OECD countries agree to invite Colombia as 37th member" (Press release). OECD. 25 May 2018. Retrieved 3 June 2018. ^ "Peru eager to become an OECD member". Andina.com.pe. 15 November 2012. Retrieved 30 May 2013. ^ "Malaysia has applied to become a member of the Organisation for Economic Co-operation and Development". Daily Express. 24 April 2011. Retrieved 30 May 2013. ^ "Brazil Is Seeking to Join the OECD Despite Its Political Crisis". Fortune. 31 May 2017. Retrieved 22 January 2018. ^ Twitter. "PLENKOVIĆ U DAVOSU Sastao se s Federicom Mogherini, gruzijskim premijerom, švicarskom predsjednicom i šefom OECD-a -Jutarnji List". Jutarnji.hr. Retrieved 20 January 2017. ^ "Organisation for Economic Co-operation and Development". Oecd.org. 28 November 1962. Retrieved 13 January 2014. ^ "OECD Yearbook 2011". OECD Observer. Retrieved 13 January 2014. ^ "OECD Observer". M.oecdobserver.org. Retrieved 13 January 2014. ^ "Subscribe to OECD Observer". ^ "Crossword No.2 2013". OECD Observer. Retrieved 13 January 2014. ^ "Find, compare and share OECD data". OECD Insights Blog. 26 January 2015. Retrieved 2 October 2018. ^ "New data visualization project: OECD Data Portal · molily". Retrieved 2 October 2018. ^ "The Power of Peer-Learning, chapter 3: OECD's Basic Rules of Conduct – A Sociology of its Institutional Culture". IRDC. 2007. Archived from the original on 2 June 2008. Retrieved 31 July 2008. ^ "OECD Global Forums". OECD. Retrieved 29 October 2017. ^ "OECD Eurasia Week". OEC. Retrieved 29 October 2017. ^ "After A Battle, Oecd Settles On Swede To Be Interim Leader". Joc.com. 22 February 2018. Retrieved 27 August 2018. ^ Friedman, Alan (29 October 1994). "U.S. Rejects Extending Paye's Term : Rift Over OECD Leader". The New York Times. Retrieved 27 August 2018. ^ "On-Line Guide to OECD Intergovernmental Activity". .oecd.org. Retrieved 4 November 2011. ^ "OECD Organisational Chart". .oecd.org. Retrieved 11 January 2018. ^ "Países industrializados alaban avances económicos de Chile" (in Spanish). El Mercurio. 18 June 2004. Retrieved 31 May 2013. ^ "Chile está entre los mejores aspirantes para entrar a la OCDE" (in Spanish). El Mercurio. 16 June 2004. Retrieved 31 May 2013. ^ a b c d "Brazil:- OECD Council Resolution on Enlargement and Enhanced Engagement - Organisation for Economic Co-operation and Development". Oecd.org. Retrieved 31 May 2013. ^ "Chile invited to become a member of the OECD". Organisation for Economic Co-operation and Development. 15 December 2009. Retrieved 31 May 2013. ^ a b c d "Christopher pitches for new role for former communist countries with PM-France-OECD". Associated Press. 8 June 1994. Retrieved 2 June 2013. ^ a b c "Organisation for Economic Co-operation and Development". Oecd.org. 10 May 2010. Retrieved 31 May 2013. ^ Adenauer und die Hohen Kommissare, Munich 1989, p. 465. Available here. ^ Zsófia Árvai (November 2005). "Capital Account Liberalization, Capital Flow Patterns, and Policy Responses in the EU's New Member States" (PDF). IMF Working Paper. International Monetary Fund. ^ "Israel: Ready for the OECD" (PDF). Israel Ministry of Finance. March 2006. ^ a b F. C. Langdon (1 November 2011). Japan's Foreign Policy. ISBN 9780774843546. ^ Woong Shik Shin. "LIBERALIZATION OF LEGAL SERVICES MARKET IN KOREA" (PDF). ^ "South Korea joins OECD: South Korea was formally invited..." Chicago Tribune. 25 October 1996. ^ "Remarks at the signing of the Accession Agreement with the Republic of Latvia - OECD". OECD. Retrieved 14 April 2018. ^ ""Accession: Latvia invited to join OECD - OECD"". 11 May 2016. ^ "Latvia's accession to the OECD". OECD. 1 July 2016. Retrieved 6 July 2018. ^ "Roadmap to membership at the OECD for Lithuania - OECD". OECD. Retrieved 5 July 2018. ^ "Lithuania's accession to the OECD". OECD. 5 July 2018. Retrieved 6 July 2018. ^ "MEXICO FORMALLY INVITED TO JOIN OECD AS 25TH MEMBER". Associated Press. 14 April 1994. ^ "ORGANIZACJA WSPÓŁPRACY GOSPODARCZEJ I ROZWOJU" (in Polish). ^ "POLAND JOINS THINK TANK OF RICHEST NATIONS". Associated Press. 11 July 1996. ^ a b "Slovakia politics: Slovakia officially joins OECD". BBC Monitoring. 18 December 2000. ^ "Accession Process | Ministry of Foreign Affairs". Mzz.gov.si. Retrieved 31 May 2013. ^ Julio Crespo MacLennan: Spain and the process of European integration, 1957–85, Basingstoke 2000, p. 31. Available here. ^ "Member Countries". Oecd.org. 1 January 1970. Retrieved 23 October 2010. ^ "OECD Accepts Colombia as 37th Member". Latin American Herald Tribune. 25 May 2018. Retrieved 1 June 2018. ^ "Colombia:- Global OECD boosted by decision to open membership talks with Colombia and Latvia with more to follow - Organisation for Economic Co-operation and Development". Oecd.org. Retrieved 31 May 2013. ^ a b c d e f "OECD strengthens engagement with partner countries during annual Ministerial Meeting" (Press release). OECD. 1 June 2018. Retrieved 3 June 2018. ^ "Donald Trump praises Jair Bolsonaro, opens door to Brazil's ambitions". DW News. Retrieved 24 March 2019. ^ a b c d e "World Development Indicators". World Bank. 18 October 2018. ^ "Human Development Report 2018". United Nations Development Programme. 14 September 2018. ^ "Global Data | Fragile States Index". The Fund for Peace. 23 April 2018. ^ "Rule of Law Index 2017-2018". World Justice Project. 31 January 2018. ^ "Corruption Perceptions Index 2017". Transparency International. 21 February 2018. ^ "Country Rankings: World & Global Economy Rankings on Economic Freedom". Heritage Foundation. 2 February 2018. ^ "Global Peace Index 2018". Vision of Humanity. 6 June 2018. ^ "2018 World Press Freedom Index". Reporters Without Borders. 25 April 2018. ^ "Democracy Index 2017" (PDF). Economist Intelligence Unit. 31 January 2018. ^ "OECD iLibrary (formerly: Source OECD)". Ontario Council of University Libraries. 28 November 2011. Archived from the original on 5 March 2016. Retrieved 29 January 2017. OECD iLibrary is OECD's Online Library for Books, Papers and Statistics and the gateway to OECD's analysis and data. It has replaced SourceOECD in July 2010. Wikimedia Commons has media related to OECD. The Group of 77 (G77) at the United Nations is a coalition of 134 developing nations, designed to promote its members' collective economic interests and create an enhanced joint negotiating capacity in the United Nations. There were 77 founding members of the organization, but by November 2013 the organization had since expanded to 134 member countries. Since China participates in the G77 but does not consider itself to be a member, all official statements are issued in the name of The Group of 77 and China. The Nuclear Energy Agency (NEA) is an intergovernmental agency that is organized under the Organisation for Economic Co-operation and Development (OECD). Originally formed on 1 February 1958 with the name European Nuclear Energy Agency (ENEA)—the United States participated as an Associate Member—the name was changed on 20 April 1972 to its current name after Japan became a member. Central and Eastern Europe, abbreviated CEE, is a term encompassing the countries in Central Europe, the Baltics, Eastern Europe, and Southeastern Europe (Balkans), usually meaning former communist states from the Eastern Bloc in Europe. Scholarly literature often uses the abbreviations CEE or CEEC for this term. The Organisation for Economic Co-operation and Development also uses the term "Central and Eastern European Countries (CEECs)" for a group comprising some of these countries. This article lists countries alphabetically, with total tax revenue as a percentage of gross domestic product (GDP) for the listed countries. The tax percentage for each country listed in the source has been added to the chart. Note: This list is sortable. Click the sort buttons at the top of the chart. The Organisation for Economic Co-operation and Development's (OECD) Development Assistance Committee (DAC) is a forum to discuss issues surrounding aid, development and poverty reduction in developing countries. It describes itself as being the "venue and voice" of the world's major donor countries. Enrico Giovannini is an Italian economist and statistician, member of the Club of Rome. Since 2002, he has been a full professor of economic statistics at the University of Rome Tor Vergata. He is Senior Fellow of the LUISS "School of European Political Economy", member of the “Commission Economique de la Nation” of the French Government, and co-chair of the "Independent Expert Advisory Group on the Data Revolution for Sustainable Development" established by the Secretary-General of the United Nations. He is also chair and member of several boards of Italian and international organisations. From April 2013 to February 2014 he was Minister of labour and social policies in the Italian government. From August 2009 to April 2013 he was President of the Italian Statistical Institute (Istat). From January 2001 to July 2009, he was Director of Statistics and Chief Statistician of the Organisation for Economic Co-operation and Development (OECD). The Global Green Growth Institute (GGGI) is a treaty-based international organization headquartered in Seoul, South Korea. The organization aims to promote green growth, a growth paradigm that is characterized by a balance of economic growth and environmental sustainability. GGGI provides research and stakeholder engagement for green growth plans, especially in developing countries, aiming to replace the more typical paradigm based on industrial development.